The Seychelles are a true paradise and naturally most of the worlds luxury hotel brands have settled there. An often underrated chain is the Kempinski group, founding member of GHA, originating in Berlin, Germany, in 1897. 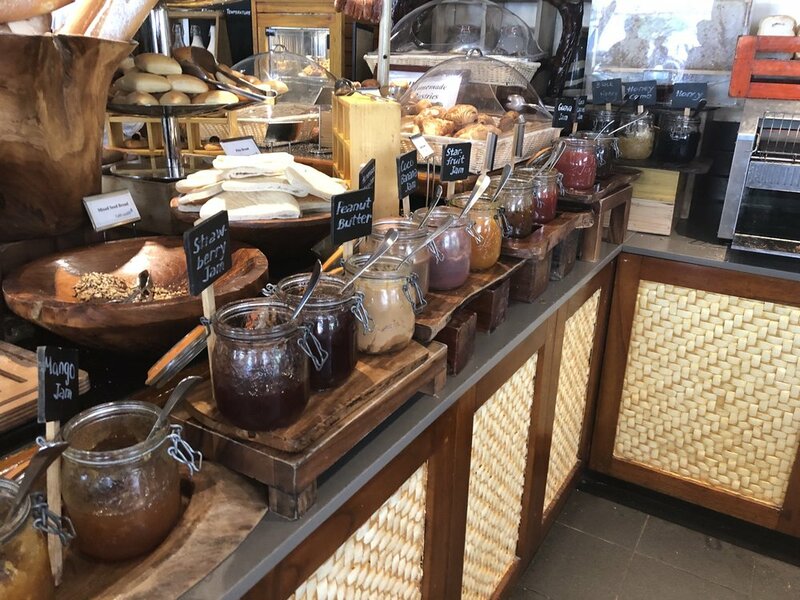 Far from the cold of the Northern hemisphere they also set up shop on the Seychelle’s main island Mahé in the Baie Lazare, a wonderful bay where they are the only hotel. It’s a five star resort with a huge footprint, promising facilities and an acceptable price. Does it all add up? Let’s find out! Arriving to the Kempinski Seychelles is quite impressive since you will be driving on a long private road over their estate before you even reach the main building. We were welcomed with a smoothie and wet towel. The reception had a tropical open architecture. Service was friendly and efficient. We were driven with a golf cart to our room in the Mangrove Court. Around the mangrove court is a nice park area with a lake. But don’t fear: the beach and pool are only a five minute stroll away. We had room facing the artificial lake - nonetheless a very nice lake - and the heliport. The latter was not a problem, we were never in the room when a heli landed (damn…), but of course the sea view rooms were much more expensive. The size of the room was generous, including a sitting area as well as a sizeable balcony. I kind of liked the materials used and the tropical modern style, although it didn’t always fit so well together. 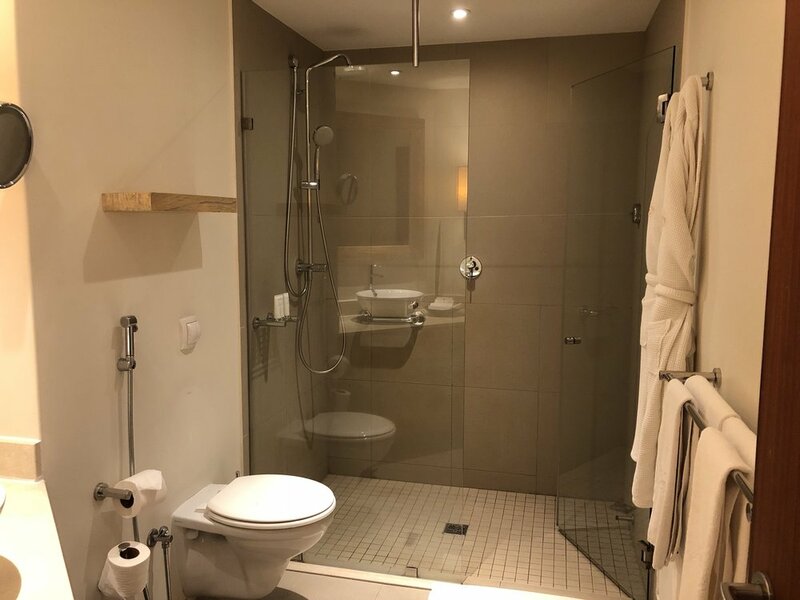 Our bathroom had a walk-in shower and the Kempinski-branded amenities (they felt good, but not sure how the quality actually is). Now this was actually a strong point of the Kempinski. Although I can only comment on the breakfast and the Windsong restaurant for dinner as we didn’t go to the fine dining place nor did we have dinner at the breakfast restaurant. 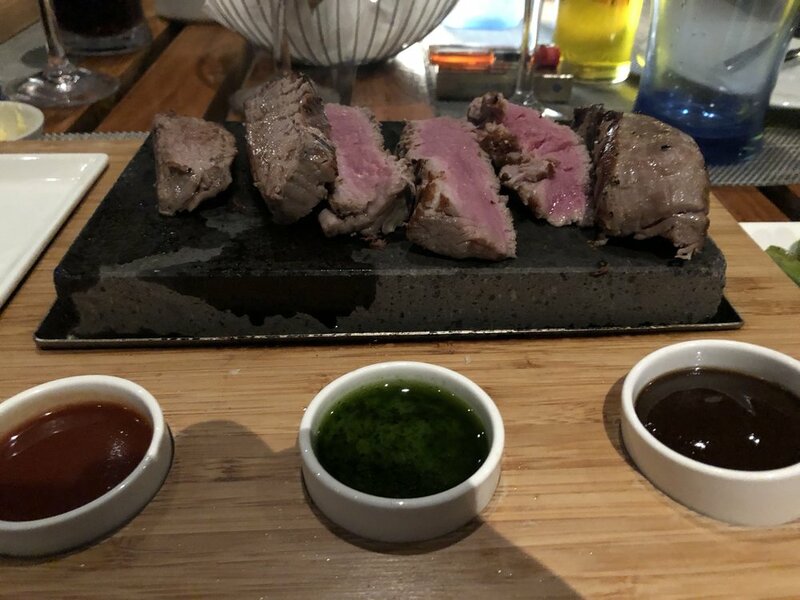 I am safe to say, though, that the casual-naked-feet-in-the-sand Windsong did serve fantastic hot stone beef steak and delicious deserts. 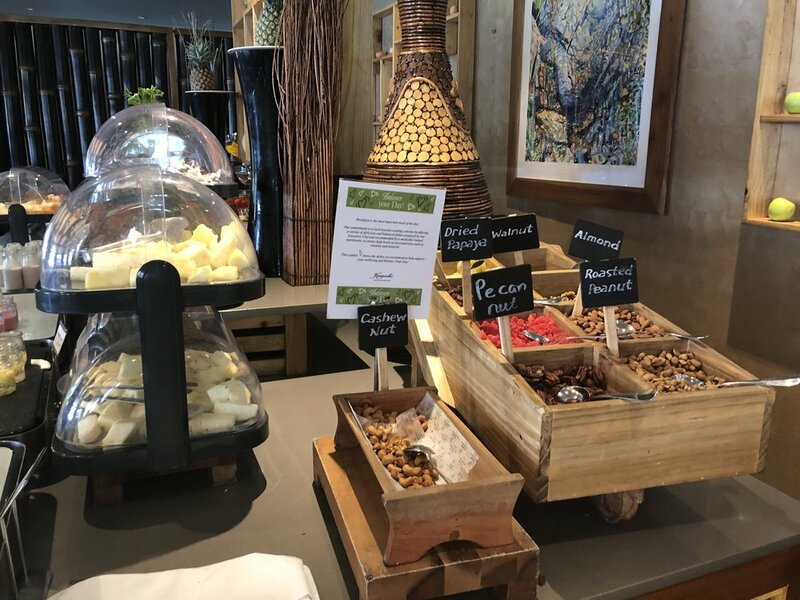 Also the breakfast had lots of good choices, fresh fruits, a hot cooking station and good service. Now to what we all came for: the Beach. The Baie Lazare is quiet and is mainly occupied by the guests of the Kempinski. It is the only hotel in this bay, but keep in mind that on the Seychelles, all the beaches belong to the people (which is probably one of my favorite laws I’ve heard of). Still, it was usually quite empty on "our” beach. The only problem I have with this beach is the very low height in the beginning, meaning, if you want to swim, you have to walk through some corals and algae. I did like the pool for its length, but it was otherwise not very spectacular regarding view or design. There are quite a lot of things to do even if you are just staying inside the resort. A third-party with a shop on premise offer canoeing, snorkelling, deep diving and other water sports all with an international guide. We did snorkelling the local reef, of which corals are unfortunately dead, and our guide showed us very cool fishes. It was a fun experience only tainted a little by small, nearly invisible algae that burned our skin (something they don’t tell you in the brochure…). Apparently March was the season for those. There is a tennis court, a spa (haven’t tried it this time), and you can hike onto the little rock behind the hotel and do morning yoga there (makes for good instagram pictures). There were also beautiful white horses and of course the Seychelles animal number one: big tortoises. 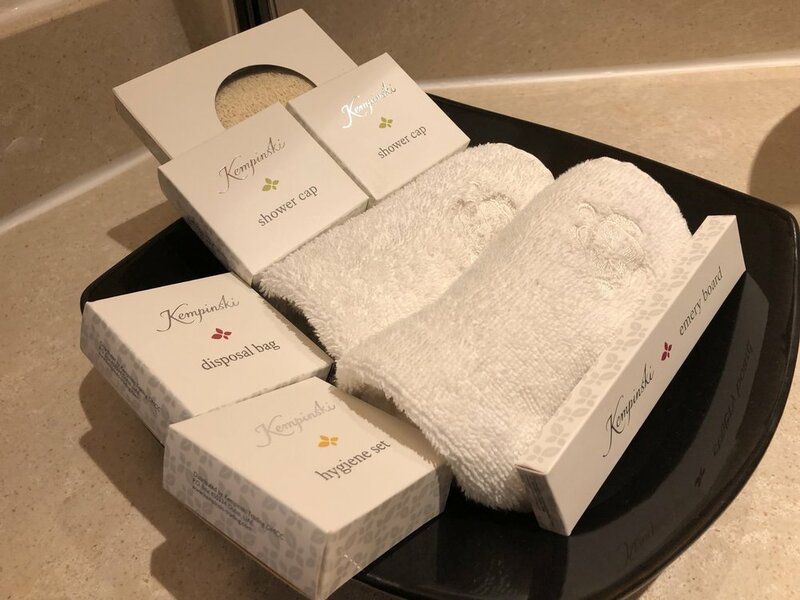 For those of you who might underestimate the Kempinski brand, on the Seychelles you’ll find your cure. I was actually surprised by the quality of nearly everything. Compared to the fantastic Hilton Labriz, the Kempinski loses by a little bit due to the private island feeling on beautiful Silhouette and the never-ending beach on the first. Prices are similar on both, about 500 USD for a double. Other than that, I can really recommend the Kempinski. Service and food quality complement the nice beach and explorable location on the Southwest of Mahé. 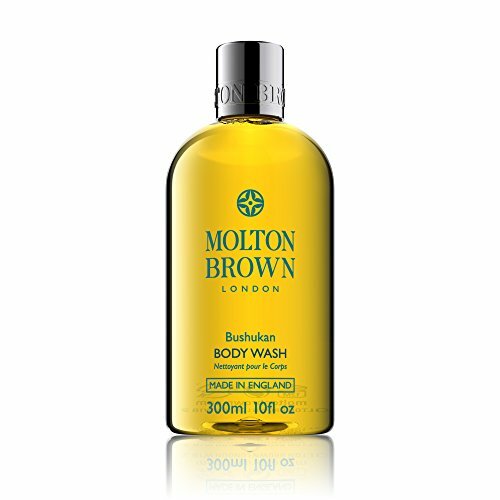 Molton Brown Bushukan Body Wash, 10 oz. I finally had the chance to try the (still relatively) new Qsuite of Qatar Airways in their Airbus A350-900. 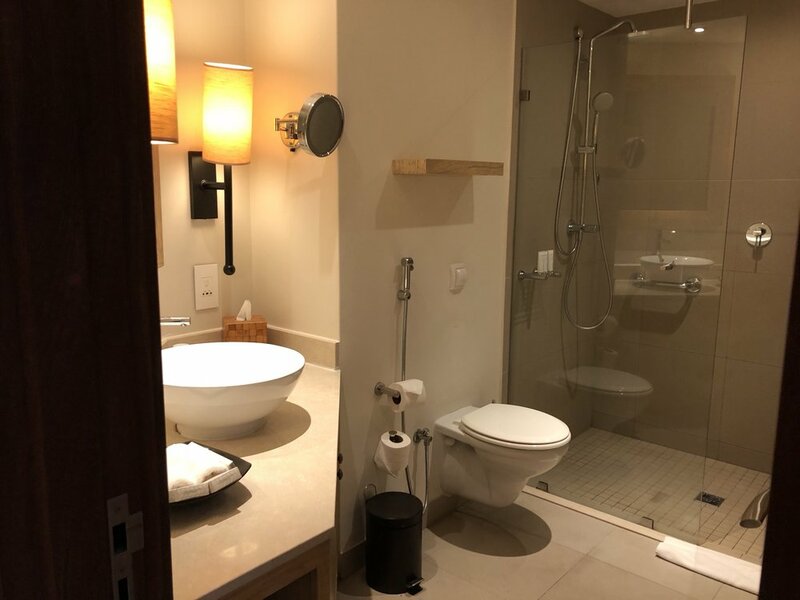 This Business Class product promises to be close to other First Class offerings and I have been eager to compare it to my Emirates or Swiss Business experiences. I was on a short layover in Doha (where I stayed close to the airport in the Sharq Village & Spa, review will follow) and had an early morning flight at 08:00 am to Zurich the next day. This meant I could try out the breakfast and catch up on sleep for about 6 hours of flight time. Let’s find out whether the upgrade price of about 600 USD for this leg was worth it! Discover something wonderful in Bordeaux. Imagine a place where nothing looks artificial, but blends perfectly into the natural environment. Where the service is first class, but nothing is bling-bling. Where you can have your dinner be prepared by a two-Michelin-star chef, without being pretentious. And all this amidst the best wine region on the planet. Sound like heaven? It might as well be - to me at least. Will you feel the same? St. Moritz - a name of glamour and prestige regarding winter holidays since 1864, where Shahs, playboys and all the other jet set of the 60s and 70s reigned supreme and today mingle with the newly rich and wannabe riches. Located in the always sunny, but high-altitudinal, Engadin county of Switzerland it really delivered on the clearest air I have experienced at -4° F (-20° C) in mid-December. Similar to the heat of Dubai, it was a dry cold that felt slightly more bearable than elsewhere. The Crystal hotel is part of the SLH network, and, uncommon for them, only has 4 stars. This doesn’t have to be bad - I stayed at wonderful 4 or 3 star hotels - but does the Crystal surprise with unsuspected wonder?